Most experts agree that dyslexia accounts for 80% of all learning disabilities, and nearly 20% of the population is hampered by it. However the rates of dyslexia soar higher among the homeless and the incarcerated. The intersectionality with mental health issues is clear as well. While people of means can find tutors and specialized schools for their kids, as well as relief for the anxiety and depression that comes with failing, too many other families are left behind. As dropping literacy rates were noticed throughout the 1990s, Congress called for a National Reading Panel. To examine best practices in reading instruction, the panel reviewed 100,000 studies and published a comprehensive report. Among other things, there was no evidence to show “whole language” pedagogy is effective. Whole language focuses on reading sentences and paragraphs, but ignores words. Rather, the report concluded that teaching children the relationship among sounds, letters and spelling patterns improves reading for all struggling readers, not simply those with dyslexia. Since then, the “balanced literacy” approach became popular and helps natural readers but still leaves out struggling readers and dyslexic students. 20 years after the National Reading Panel we have made little progress in preparing teachers to teach reading and writing. The specialized schools train their own teachers. The International Dyslexia Association has identified only 25 colleges in the U.S. that prepare teachers to work with dyslexic readers. If you are interested I can send you research on the intersectionality of dyslexia and mass incarceration, and a separate report on dyslexia and homelessness. 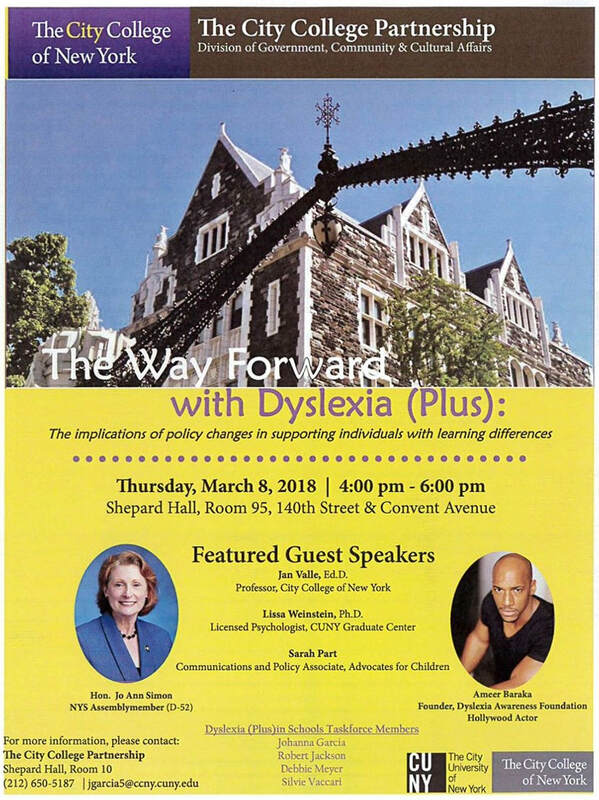 Yale and many other educational institutions state that 20% of our population have dyslexia. Three out of every four people on welfare cannot read properly, there are strong correlation to mental and emotional wellbeing and the inability to read. Illiteracy is quoted as being the direct pipeline from school to jail and poverty (NAAL). We know of many students who read years below their grade level (67% of 4th graders) and are not getting programs from their school districts in the Hamptons (NYSED) . 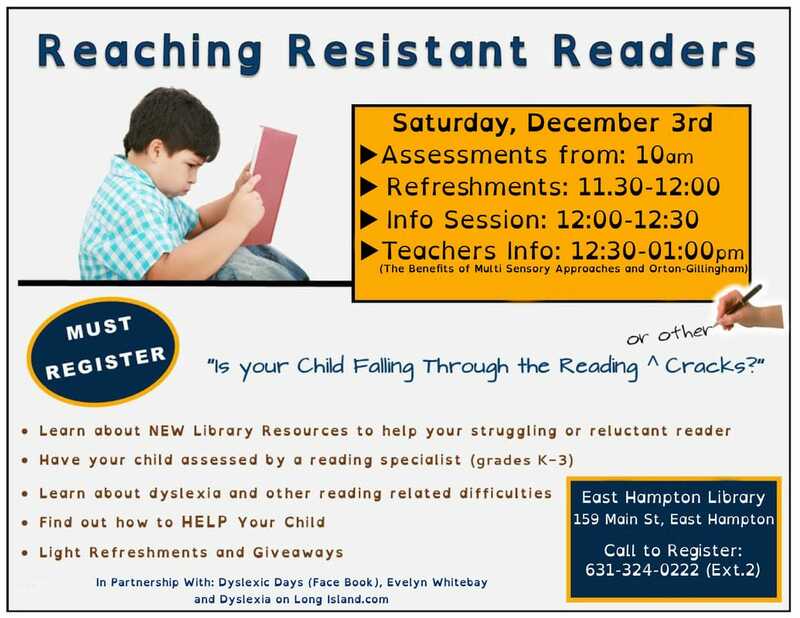 Because of these issues we are holding an East Hampton Library sponsored initiative "Reaching Resistant Readers" on Saturday 3rd December (see flyer attached). An Orton-Gillingham specialist who works at a public school Upstate will be in East Hampton to conduct assessments for K-3rd grade (using PAR) and present informational sessions to parents. The session at 12.30-1pm is particularly designed for special education teachers, school psychologists and administrators. We will also have a specialist in assistive technology demonstrate the newest AT and other resources. The informational sessions for teachers are centered in multi-sensory approaches, structured literacy and Orton-Gillingham. The goal is to get as many teachers interested in training as possible so we may hold a training session locally at the Peconic Teachers Center, otherwise our teachers will have to travel to NYC and it is not possible for those who have young children. Wilson Intensive is a good program for dyslexic students or those who are reading a few years below grade level - it is a kick-starter of a program. The majority of teachers can be trained in it as it is a highly structured program and falls within reach of the skills and knowledge of the majority of special education teachers. The down side is that it does not help with dysgraphia, in the way many children need to learn math, it does not reach our autistic community (many children on the autism spectrum have learnt to read using Orton-Gillingham). Orton-Gillngham centers on multi-sensory approaches, there are many other factors that are not included in the Wilson Intensive program as a result children will not develop some critical skills or may not be reached at all. Many special education teachers are tasked with helping children at the end of the day to grasp math concepts that may have eluded them during the lesson - wouldn't it be smarter to have the special education teacher then teach the class using a multi-sensory approach? By using a different part of the brain to learn aspects of writing or math a child will make the progress that would otherwise be completely lost. Next September all special education teachers at City University NY will be trained in Orton-Gillingham, all current public school special education teachers will be retrained in Orton-Gillingham (http://www.ortonacademy.org) but that is the city-too far for our teachers to travel. We have a brilliant opportunity to train teachers on the east end, if we had enough teachers interested the Peconic Teachers Center would be interested in conducting training locally so all teachers interested may train.